A crisis is your golden moment: Seize it! When in a crisis situation, after all the initial fear and anxiety has left you crippled, when you are with yourself, and are grudgingly begin to accept your reality, take stock, dispassionately, calmly of whatever’s going on. Ask yourself what can you do about the situation you are faced with? There are only two ways to deal with any challenging situation: either you can do something to solve it or simply accept it. Most often we are able to see that, in some situations, we can’t do much to solve it. Even so, we simply refuse to accept the crisis, the situation, the reality. We wish things were not the way they are. This is what leads to suffering. Acceptance, on the other hand, ensures freedom from suffering, even if the source of pain, the crisis, doesn’t go away. When you are free from suffering, your inner peace will guide you to learn from the crisis and help you avoid feeling burdened by it. Every crisis we are faced with, without fail, is a precursor to a blessing, an opportunity. Extra-ordinary pain is not some cosmic ordinance for all the sins you have committed in this lifetime, or another one (as most religions will have you believe and, perhaps, fear), but is always a prelude to extra-ordinary grace that is due to drench you in its brilliance! 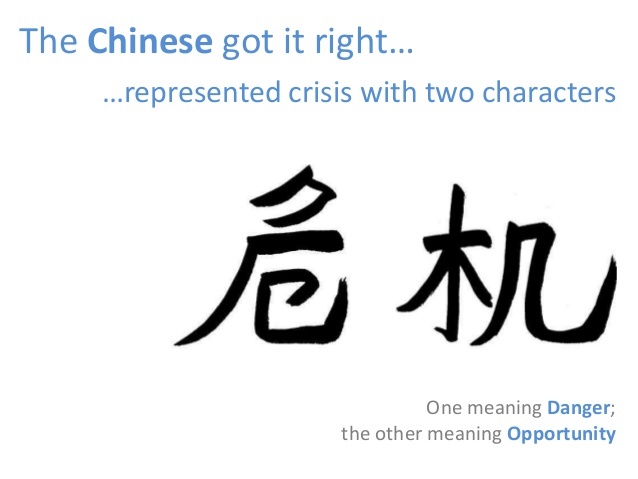 In the Chinese language (although academic purists and linguistic experts do argue otherwise) the word for “crisis” is made up of the amalgamation of the Chinese words for “danger” and “opportunity”. Even if the purists’ view is considered, they concur that ‘weiji’, the Chinese word for crisis, does mean ‘dangerous or precarious or critical or crucial point’. 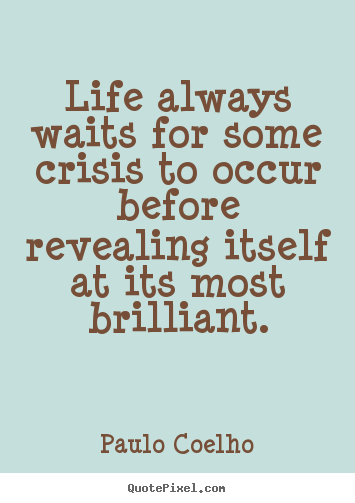 And that’s what a crisis really is – it is a critical inflection point of your Life, from one orbit to another! It is the duration of the inflection that kills any of us, and never the crisis itself. And this is where acceptance has a big role to play. To fight Life is being foolish. To accept it is intelligence. Whatever be your crisis, whatever it is that defines your circumstance right now, accept it. Some situations may bring you to the brink, may threaten to annihilate you, but your acceptance can miraculously give you the inner strength to cope with them. Life loves those that are prepared to go with it, all the way, down to the wire. So, it is that you will observe, that those who have been through excruciatingly painful times, have always emerged humbler, stronger, peaceful and more brilliant than they ever were. You will see such people in your family or among your friends itself. 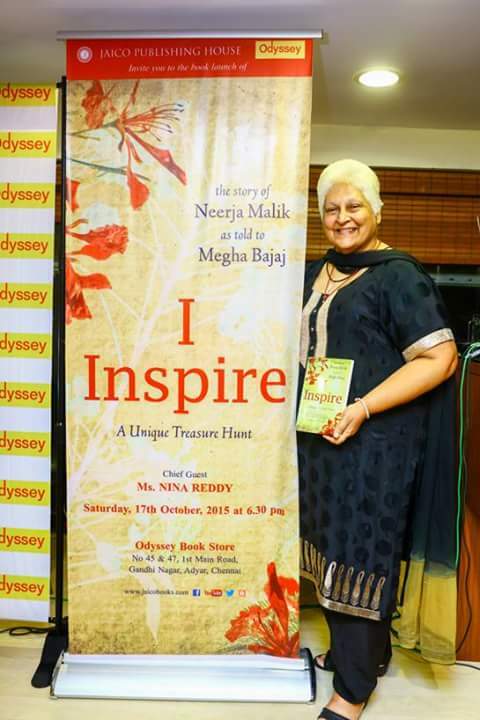 Be sure to be inspired by them than simply opinionate on them! A crisis is a golden moment. It teaches you acceptance. If you learn that lesson, it means you have got yourself the most profound qualification (higher than any other degree that the world’s most scholarly university can award you) in Life – to lead a Life of true meaning, love, peace and joy! Author AVIS ViswanathanPosted on June 14, 2013 March 14, 2016 Categories Acceptance, Art of Living, Crisis, Danger, Grace, Inner Peace, Intelligent Living, Opportunity, WeijiLeave a comment on A crisis is your golden moment: Seize it!